Kaiser Permanente rethought the guts of its new San Diego Medical Center building with patients in mind, adding circadian rhythm lighting and temperature controls to patient rooms. The clinics are flanked by an atrium, a cafe and a library with an outdoor deck. Their main concourses are dotted with furnished alcoves. One thing they don't have: designated waiting rooms. That's because patients at the clinics in the Health Transformation Building at Dell Medical School, part of UT Health Austin, can either go straight to their rooms, if available, or if they arrive early, to any of those decidedly non-institutional spaces, where in the future they'll be buzzed via a smartphone app. From the get-go, each patient's experience is markedly different than what's come to be expected: sitting in an uncomfortable waiting room chair, reading dated magazines and listening intently to be called. The clinics' design may be among the more futuristic in the country, but it points to a practice sweeping all sorts of healthcare systems: using technology to facilitate a better patient experience, rather than emphasizing cosmetic changes such as waterfalls and chandeliers. 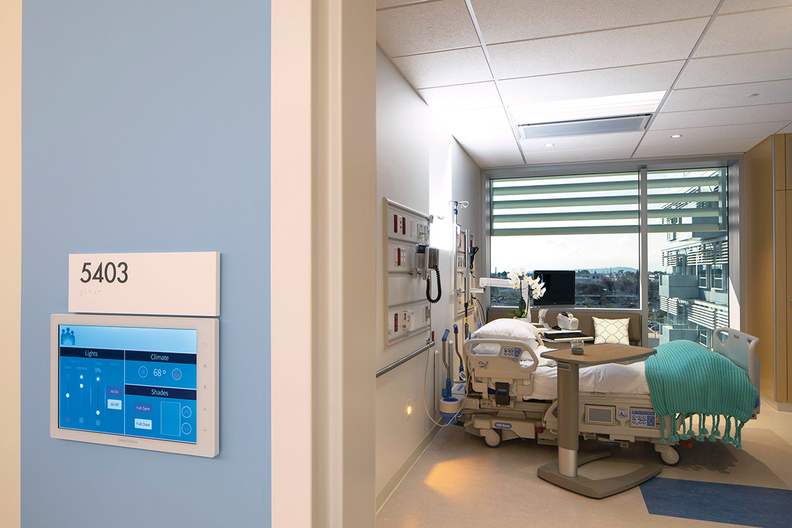 Whether it's better heating, ventilation and air conditioning, large screens in patient rooms, or comfortable places to wait for an appointment, design and technology are playing a big role in patient care—and not just in the strictly medical aspects of it but in the environmental and emotional aspects as well. Hospital design is moving beyond cosmetic changes to please patients by adding features that give them more control. The idea, as it is in other industries, is not that technology alone will solve the patient (or consumer) experience puzzle, but that technology facilitates care models that improve experience. Hospitals and clinics nationwide are adding newfangled technologies rarely seen before in healthcare settings, building them right into their facilities. In doing so, they're enabling the change from provider-centered to patient-centered care, giving patients not only a better experience but better outcomes, too. "Technology itself is not groundbreaking," said Stacey Chang, executive director of the University of Texas at Austin's Design Institute for Health. "It's the model of service you design that really matters." But the technology does matter, since without it, those new models of service wouldn't be possible. Sometimes, little things, like allowing patients to control the temperature of their rooms, make a big difference. "Giving patients control of their experience is a really big deal because it empowers them and allows them to play a role in their care," Chang said. In UT Health Austin's Health Transformation Building, whose design grew out of Design Institute for Health work, that control begins as soon as patients walk into the facility, with the waiting experience. It continues in the exam rooms, where patients can adjust the lighting and choose where to sit. "Making it manual and allowing it to be controlled by the patient is, in some ways, beneficial," Chang said. "The patient has to feel like they're allowed to do that." Hospitals, too, have been making similar changes. Kaiser Permanente rethought the guts of its new San Diego Medical Center building to give patients both more comfort and more ownership. "That's the one thing patients tend to lose—control," said Anne Marie Watkins, chief nurse executive at Kaiser Permanente San Diego. Because the building is near a freeway and a Marine Corps air station, both of which are noisy, the walls and roof have extra insulation. Other steps were taken to keep it quiet inside: All the serviceable parts of the mechanical systems are outside patient rooms, and there's very little noise from the HVAC system, a chilled beam system that allows for each room to have its own set temperature, controlled by the patients themselves. "The chilled beam allows us to treat each patient room as an individual microclimate," said Sam Totah, chief operating officer of Kaiser Permanente San Diego. That's good for patient comfort, and it's good for outcomes too. For instance, Totah said, if a patient has a high fever, clinicians may drop the room's temperature by a few degrees without having any effect on neighboring patients. The lighting was also designed with patient outcomes in mind. Circadian rhythm lighting, shining from near the head of each bed, automatically mimics the sun to keep patients from becoming disoriented; patients can also adjust the lighting on their own. "It's to promote healing," Watkins said. Providers can control the lighting, room temperature and plumbing systems from outside patient rooms, so patients and family members aren't disrupted. The power for those systems comes from an on-site energy center, which recaptures waste heat from energy production to provide cooling and base heating, adding an environmentally friendly element to a patient-centered design. Kaiser Permanente rearranged not only building elements but also people. Nurses in the San Diego Medical Center are now stationed physically closer to their patients, since there's no longer a central nurses' station. Instead, nurses have work stations outside of each patient room. That makes them more accessible to patients and their family members. "It's intimidating for a family member to walk into a nurses' station," Watkins said. Making patients comfortable has to do with more than just physical well-being—it's about intellectual and emotional well-being, too. So healthcare organizations are improving how they get information to their patients, keeping them updated about their care through connected devices like TVs and tablets. When San Diego Medical Center was conceived, designers and executives had two main ideas: engaging patients with technology to give them control, and integrating information with electronic health records. Key to much of that engagement are the 75-inch screens in patient rooms, which display information about each patient's care. Healthcare organizations are improving how they get information to their patients, using connected devices like TVs and tablets to update them about their care. The rooms at Kaiser Permanente's San Diego Medical Center have large screens to display such information. That information includes goals for the day. Similarly, at the Health Transformation Building, patients will soon be able to see their schedule for the day on a screen in their rooms, where patients stay put as providers move around. "The notion of it is really simplistic, but it can be done in compelling ways that make for much more interesting and informative experiences," Chang said. Video can also tell patients who is taking care of them. 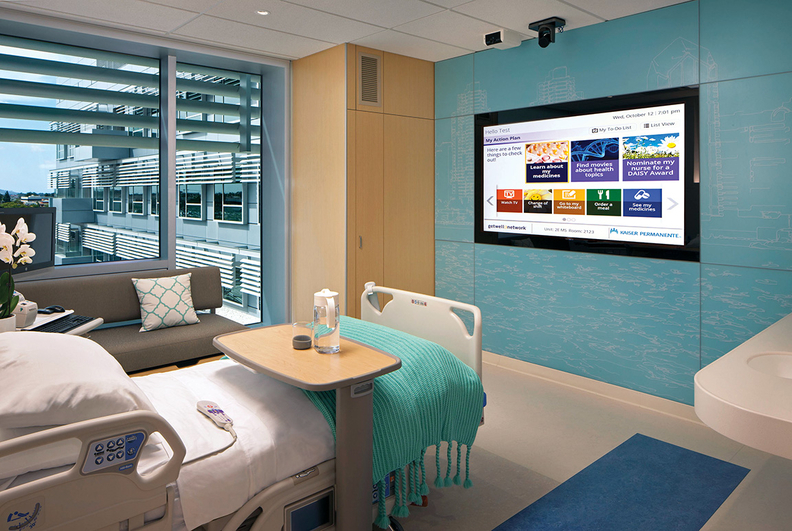 At UCSF Medical Center at Mission Bay (Calif.), each room has a 10-inch tablet and 65-inch display showing the patient who is on his or her care team. "That helps personalize the care so the patients don't feel like 'this is happening to me and I don't know who the heck you are,' " said Dan Henroid, UCSF Health's director of nutrition and food services. Information is updated in real time as providers rotate on and off. Patients can also access education materials via the screens, as well as order food—which is delivered by robots. "We have 27 different robots running around," Henroid said. "The biggest use is picking up trash," but they also bring food and medical supplies to the unit. The robots save the hospital money and help provide more expedient care, Henroid said. That includes meal services, which are run "like a hotel," he said, "so patients order what they want when they want it," as long as doctor's orders allow it. While screens may be handy for patients, they can also send the wrong message when they're in providers hands, keeping doctors' gazes directed downward, rather than toward patients. "If you were to go to the Mayo Clinic and walk around, you wouldn't see any personnel walking around using their smartphones," said Dr. Thomas Lee, chief medical officer for patient-satisfaction measurement firm Press Ganey. There's a cultural norm there, he said, that providers don't look at their phones anywhere patients might be. "When people are looking at their smartphones, it sends patients the message 'don't interrupt me,' " he said. Lee also pointed to telemedicine and related hybrid models of care. Through its Express Care System, Renton, Wash.-based Providence St. Joseph Health, for instance, allows patients to have virtual visits and then to get corresponding testing or lab work done at any site, rather than the specific site where the provider is. Part of the shift to these and other models of care is "a market-share play," Lee said. "As healthcare moves away from fee-for-service, you don't just want the sick patients—you need as many people as possible to think of you as where they get their healthcare." But it's more than the market that's encouraging new technologically enabled care models. Organizations are looking at adopting these models as a choice related to quality, rather than to finances alone, Lee said. Beryl's Wolf noted that this kind of design work should be embedded into hospitals' work every day. "If we see patient experience as something else to do, as just a project or an initiative among competing priorities, we have missed the point before we start, when we realize experience is what we do in healthcare, we create the means to achieve all we aspire to in healthcare today."